NAC Returns to Las Vegas for 2018 Conference & Expo! JACKSONVILLE, FL, January 22, 2018 - The National ATM Council, Inc. (NAC) is heading back to Las Vegas this fall for its 2018 annual tradeshow and convention. 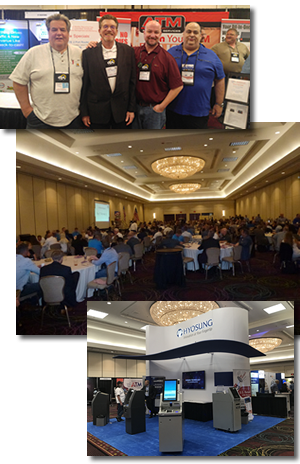 Slated for October 16th - 18th 2018, the U.S. Independent/Retail ATM industry trade association will return to Bally's Resort & Casino in the heart of the Las Vegas Strip, as the hosting venue for its 6th annual Conference & Expo. This year's schedule coincides with the completion of Bally's Indigo Tower total upgrade, providing brand new renovated room accommodations and direct Conference Center access for NAC2018 attendees. Event participants will also once again enjoy value priced group discount rooming options at Bally's, Paris, and Caesars Palace, an especially attractive feature of last year's event - back by popular demand. The event's showcase Grand Welcome Reception will be returning to the spectacular Paris Pool setting - offering one of many unique networking opportunities during NAC2018 and providing a special kick-off for this year's conference. As show organizers have noted, the overwhelmingly positive industry response to the NAC2017 event venue made the NAC2018 property selection an easy decision. "Looking to build on the strong success of last year's show, we're returning to Bally's Las Vegas for NAC2018, but we are making this year's event even bigger and better," said NAC's Executive Director Bruce Renard. "We'll be announcing a host of enhancements for NAC2018 in the coming days, so please stay tuned." For additional information, visit the NAC website at: https://www.natmc.org.